Cape Carteret’s history is relatively short. The town started as land was purchased by William Britton McLean for his sawmill operation in 1946. As McLean and his business partners continued to purchase land Cape Carteret began to take shape until it was incorporated in June of 1959. Daily ferry service by the state beginning in 1961 and a grass landing strip on a golf course opened in 1968, aided in travel to the area. By 1974 the town put into place many of the zoning regulations still largely in effect today. Being near the Atlantic Ocean, Cape Carteret is within a temperate climate featuring warm summers, cool winters and plentiful rainfall. During the summer, temperatures average around 85 during the day and 70 in the evening, while in the winter the temperature rarely drop below freezing with daytime highs in the 50s. Cape Carteret experiences 122 days of measureable precipitation with an average of 58 inches of rain per year. The Carteret County Public School System serves students in Carteret County with 10 elementary/primary schools, six middle schools and four high schools throughout the county. Carteret Community College in Morehead City and Coastal Carolina Community College in Jacksonville offer advanced education within the region. The University of North Carolina Wilmington is 75 miles down the coast from Cape Carteret. The healthcare needs of the surrounding region are served by Carteret Health Care in Moorehead City. The facility provides emergency services, neurology, radiology and rehabilitation programs among numerous others. 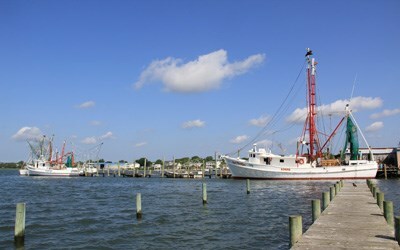 Like most coastal areas, Carteret County benefits greatly from tourism, but the area is also recognized as having a successful business and industrial climate. Solid logistics are anchored by one of the deepest ports on the east coast, the Port of Morehead City. The county is also home to marine related trades and a growing marine science education, research and technology sector. The Southern Outer Banks, called The Crystal Coast, feature 81 miles of white sandy beaches offering sunsets and sunrises over the ocean. While the area is extremely unique, the beaches remain immaculate and uncongested. Cape Lookout National Seashore is one of the few remaining natural barrier island chains and extends 56 miles. The Cape Lookout Lighthouse and Keeper’s Quarters display mid-1800s architecture, while visitors can enjoy fishing, hiking and camping. The Croatan National Forest features North Carolina native woodland with adventure trails, wildlife and bird watching. 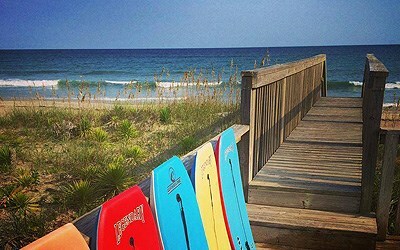 Hammocks Beach State Park, a 1,145-acre park, includes islands, channels and great fishing. The park features an extensive dune system on Bear Island and pockets of maritime forests and marshes, making it a popular destination. Kayaking, fishing and diving are also popular beach activities and are offered abundantly. Family fun can be found in Cape Carteret at The Golfin’ Dolphin and Mac Daddy’s Bowling Center. With a comprehensive marketing program and intense knowledge of the Crystal Coast, United Country – Coastal Homes Realty can find that property you have always dreamed about. We serve buyers and sellers in Cape Carteret, Cedar Point, Swansboro, Atlantic Beach, Salter Path, Sneeds Ferry, Jacksonville and beyond in Coastal North Carolina. Contact us today and let us help you achieve all of your real estate goals.